VOCAL Children, Young People & Families Forum brings together voluntary, community and social enterprise (VCSE) organisations working with children, young people & families in salford for mutual benefit, representation and to support their organisations development and capacity including the development of quality and good practice in their work. It provides broad ranging representation of the interests and views of VCSE organisations working with children, young people and families in Salford. VOCAL represents these views to Salford Children and Young People’s Partnerships and commissioning bodies as agreed by the Forum..
VOCAL Children, Young People & Families Representatives aim to ensure that our service users interests are considered and our member organisation’s expertise and diverse experience fully informs commissioning and strategy and works with partners towards a more effective, joined up service to better meet the needs of and improve outcomes for children, young people and their families. The full VOCAL forum meets 4 times per year. 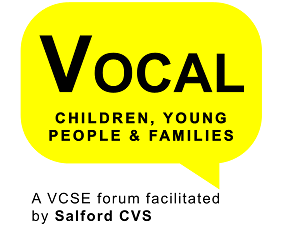 Membership is open to VCSE organisations working with children, young people and families in Salford. To become a member sign up for our VOCAL Children, Young People & Families Forum and E-bulletin. Sign up here. Salford CVS have undertaken a research project alongside the 0-25 Transition work Salford City Council and the NHS Salford Clinical Commissioning Group are undertaking. Our Research and Development worker, Lucy Sutcliffe, has surveyed, interviewed, run focus groups and generally picked the brains of representatives and participants from 50 Volunteer, Community and Social Enterprise Groups in Salford that work with children and young people. A copy of the report is now available by scrolling down the Project page on the following link:. The aim of this protocol is to enhance partnership working between voluntary, community and social enterprise organisations (VCSE’s) and Salford City Council children’s services. This protocol is intended to assist all partners in the delivery of Salford’s Early Help Strategy www.partnersinsalford.org/earlyhelp.htm and to ensure clear expectations on key safeguarding processes. The protocol particularly recognises the need to work effectively together in the context of reduced resources so that Salford families continue to benefit from a range of appropriate services and activities in the city. Find out more about the protocol. Or visit our safeguarding and young people page here.